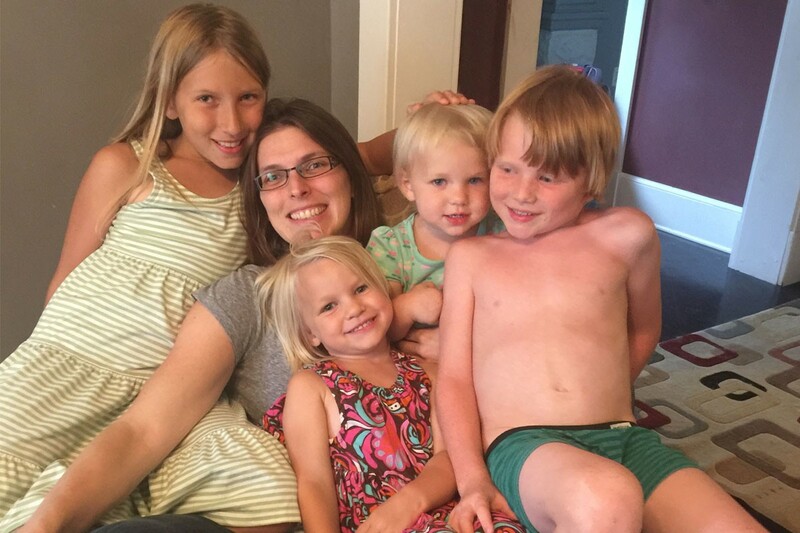 Jane Ervin’s daughter, Michelle, and her grandchildren (from left), Moxie, Nova, Juniper, and Zephyr. How do you adjust to life as a single mom, especially when you lack easy access to resources such as ESME, you are reeling from the unexpected collapse of a marriage, and you are bound to a demanding career? How do you experience the joys of being a Solo Mom while accepting the realities that you lack help taking care of the mundane but important daily demands, such as getting groceries and keeping your house clean? As the following personal story attests, you learn how to ask for help and draw from your spiritual reservoir. In the 1980s, Jane Ervin found herself alone with an active child after an affair between her husband and another woman resulted in the sudden end to her marriage. She needed to figure out how she was going to raise her daughter, Michelle, even while her job required her to work long hours and travel extensively. As she describes in the following interview, she needed to learn how to be resourceful. In addition to sharing her own story, she offers several tips for handling the stress of being a single mom while managing a career. She also provides a perspective on how being a Solo Mom has shaped her as Michelle has become a mom and has relied on Ervin for help, too. Read on for more insight as Ervin reflects on the long but fulfilling journey of a Solo Mom. A: I married young, at 21, and my husband was eight years older than me. I never dreamt we would end up divorced. I always thought very highly of Herb; he was a very kind man and had a great sense of humor. When I was pregnant with Michelle, we moved from the Chicago area to Springfield, Illinois, so he could start a new career as a restaurant manager. At some point, he became involved with a coworker. I didn’t really put two and two together until many years later. He married her six weeks after our divorce became final; I’m still in shock all these years later that he did that. It was so out of character for him. At the time we separated, neither one of us was putting much effort into the relationship. I blamed myself for a long time for letting the marriage fail, but in all reality, he was older and more mature and left his wife and baby girl for another woman. I know I would have stayed and worked on the marriage if he had asked me to. Q: Where did you work when you were raising Michelle as a Solo Mom? A: I worked for Blue Cross Blue Shield (BCBS) of Illinois from 1982 to 2012, for the majority of Michelle’s life. My job was very stressful, and I worked a lot of hours and traveled quite a bit. It was a challenge to find child care during the early years. Q: How did you handle that? A: My ex and his wife moved back to the Chicago area; before Michelle was in school, we would meet halfway for drop-off and pickup about once a month. My mother died in January 1982, and my father lived in Maryland. Both of my brothers were out of state. I had no family to rely on. My father and stepmother suggested that I move to Baltimore to be close to them so that they could provide support. I even went there to look at homes. But my ex begged me not to go. So, I didn’t. Michelle was a very active child: her legs always had bumps and bruises on them. She loved to read and be read to, and cherished her relationships with family, friends, and animals. When Michelle started kindergarten, I found a great child-care provider who had twin girls the same age as Michelle. She was a lifesaver and would pitch in with extra hours if I needed her to. My ex and his wife eventually moved back to Springfield around this time, and Michelle would visit them every other weekend, which helped a lot. Q: Can you speak to Michelle’s relationship with her dad and stepmom? A: I do wish [Michelle’s stepmom] had been kinder to Michelle when she was growing up. She is very nice to her now that Michelle is an adult, but I struggled with how she treated her as a child and my ex always took his wife’s side. Besides those weekends, my ex never saw Michelle during the week. I often wonder why he couldn’t have taken her to McDonald’s once or twice a month for daughter-father time, just the two of them. I know it would have made all the difference. He never had Michelle alone, without his wife and/or daughter there, too. My ex and his wife have a daughter about five years younger than Michelle. Their daughter always adored Michelle, and [the girls] have a very good relationship to this day, but the stepmother always made her preferences clear: her daughter came first. My ex-husband has missed out on many things in Michelle’s life, and he can never get those back. Neither can she. Q: Do you have any tips for balancing parenting and work as a Solo Mom? A: My tip for balancing work and parenting is, if it’s financially feasible, to hire a house cleaner! I used to spend Saturdays cleaning house, which left little time with Michelle. When I was finally able to rid myself of that responsibility, the weekend opened up and I could just enjoy being with her; [cleaning] was one less thing to worry about. Also, make friends with other Solo Moms, and just other moms in general. Q: Was Springfield a supportive community in which to solo parent? A: When I was growing up, we lived in three different states, four different cities. I wanted something different for Michelle: she was born in Springfield, and she lived there until she graduated from college and moved to Virginia. (We joke about how she was more than ready to leave Illinois as soon as she could!) I can’t say Springfield was exactly a “supportive” community. There was a Parents Without Partners group that I joined for a short while, but if I needed support, I had to ask for it myself. Q: What are you most proud of when you look back on your years as a Solo Mom? A: I’m proud that I tried hard to make a living and to give Michelle as many opportunities as I could for her to be successful in life. I’m proud that I did the best that I could at the time. I’m proud that she is a much better version of myself. I’m also proud that I never said anything negative about her father to her. Q: What do you remember being the biggest challenge(s) of solo parenting? A: The biggest challenge raising a child by myself was finding time to myself and asking for help. I remember lying awake at night worrying about who would take care of Michelle if I got sick and couldn’t. For a while, I got strep throat every year and was totally incapacitated for a day or two. Fortunately, I always found someone to pitch in. Once, Michelle’s stepmother’s father took her for the day. Such a kind man. Q: How do you think having been a Solo Mom has informed the way you approach adversity? Life in general? A: When things get a little tough now and I remember those solo-parent days, I realize that time moves on and nothing stays the same. Praying for strength helps, too. Many times throughout Michelle’s childhood, I often told myself that if I had known how hard it was to raise a child by myself, I would never have divorced. I so envied two-parent households and sometimes joked (not really a joke, though) that I would give anyone $50 if I could just go to the grocery store by myself. As Michelle got older and more independent, I found myself wandering through the grocery aisles aimlessly. Maybe I was just enjoying it retroactively! Q: Michelle is now a mother herself? A: Yes, she has four beautiful children. I’m so proud of who she is. She is a loyal, supportive friend to others (and to me); creative, joyful, and kindhearted; and a loving, patient mother. She is also a teacher, and this fall just started her yearlong practicum at a Montessori school. When I was soloing it, I had a good friend and coworker who was also a single mom. She also had one daughter. We relied on each other quite a bit. I remember telling her that when our daughters grew up, I could see them being stay-at-home moms and having more than one child. True enough, my daughter stayed home for almost 10 years, and my friend’s daughter had four children of her own and was a stay-at-home mom. I know Michelle longed for a brother or sister, and I wish I could have given her one, but it didn’t work out that way. I didn’t see how I could parent two children alone. (I’m in awe of those who can!) I remarried when Michelle was nine years old, but that marriage didn’t work out. Q: Do you think that having been a Solo Mom has informed the way you grandparent? A: I understand how important it is for a parent to get some downtime, and with four kids, I know my daughter relishes any help she can get. When I visit her (she lives several states away), I am happy to step in so she can go out to dinner with her husband, see a movie, or even take a bath. My husband and I have our house for sale and plan to move close to Michelle so I can be there when she needs assistance. She’s now back to work, and I know how much I would have benefited from having a relative nearby when she was growing up—someone I could have counted on for those days when Michelle was sick or I just needed some rest. I try to remind myself to cherish each age with my grandchildren. So many times when I was raising Michelle, I longed for her independence. But, once that inevitably came, I wondered where the years had gone and wished for just one more day with a kindergartner. Q: Do you think that the life of a Solo Mom has changed much, if at all, since you were raising Michelle? A: I don’t know if the life of a Solo Mom has changed much in 37 years. I’m sure it’s just as challenging now as it was then. I do love how there are so many more children’s movies out now and quality TV programming. I can remember the first time Michelle saw Sesame Street. She was enthralled, and we tried to never miss it when it was on. Now, you can find it [and other good shows for kids] at the push of a button. With the Internet, it might be easier to build a support group, too, like ESME. Q: What is your advice to Solo Moms raising kids today? A: My advice is that even on those days when your patience has worn thin and you don’t think you can do this one more minute, know that you’ve still probably done something right. Don’t beat yourself up if your loneliness and weariness engulf you. Ask for help if you can. Tomorrow is another day. I also want to add that, as hard as it was at the time, everything turned out for the best, I think. I’m proud of the person Michelle is, and as stressful as it was working at BCBS, I retired at 59-1/2 with a good pension and 401(k) that I might not have had if things had been different. I guess you never know where another path would have led, but I’m grateful for where I am now.